With the recent brouhaha following Linda Ikeji’s blog being temporarily shut down by Blogger, many writers/bloggers/online content marketers are frantically praying searching for information regarding copyright infringement in order to ensure the devil does not send a MrAyedee into their life they don’t run fowl of the law and also have their blogs shut down. While copyright laws regarding the internet are well established in foreign jurisdictions, in Nigeria we jus dey open eye, blogging just blew up in Nigeria a little over 5 years ago. But you can always catch our blog post on copyright laws. People tend to get a little protective of their stuff because there are many unscrupulous people out there who take content and pass it off as their own. Having done all that hard work with none of the credit is totally not cool! Copyright infringement occurs when any person uses any of your work – no matter how small it is – for any of his/her personal benefits irrespective of whether or not he gives you the attribution, unless that person has a written permission from you. Content could be in many forms such as text, artwork, sound and video (including animations), ideas, inventions or symbols. Once your work is published – irrespective of whether on paper or digital media – you own the sole rights to: use the work; allow reuse; allow derivatives and allow others make profit from your work. If you are the copyright holder, it means that ONLY YOU are allowed to make copies of the work and should you wish – others and only the ones to whom you give written permission can use the work. At this point it is important to note that the saying “because it’s posted on the internet, then it’s free” is totally misleading and untrue. 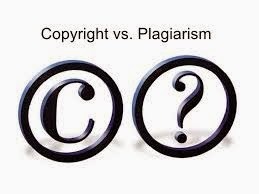 Plagiarism on the other hand is “the use of another’s information, language, or writing, when done without proper acknowledgment of the original source.” However, the critical element of it is the final part. The one thing that ties all plagiarism together is going beyond merely duplicating the work, but also not crediting the source and thus taking the material for yourself. 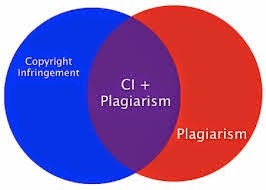 However, not all incidents of plagiarism are considered copyright infringement. Plagiarizing works in the public domain, though unethical, is not considered copyright infringement. If you took the photo or created the graphic and are not subject to a Work For Hire agreement, then you own it. Taking another person’s image or graphic and giving them a “shout out,” linkback, or any other type of attribution does not negate copyright infringement. Copyright law gives the copyright holder the right to decide where their work is published and maybe they don’t want their work on your site, in your book, included in your newsletter or distributed to your social media network. Ask people for the rights to use their work, it is either they say yes or no. It may be acceptable to use an image, as is, on your blog, but you may not have the right to use that same image in a paid newsletter, book, video or other type of work. Unless the image is in the public domain or you are the copyright holder, you have to consider the use(s) granted by the copyright holder or license. A copyright holder may be agreeable to certain uses but not to others. Also when you take part of a person’s written/published work, it is important that you write the reference properly in other to avoid plagiarism allegations.